THIS is a book about Orkney, for use in Orkney, designed and for the most part written by natives of Orkney. 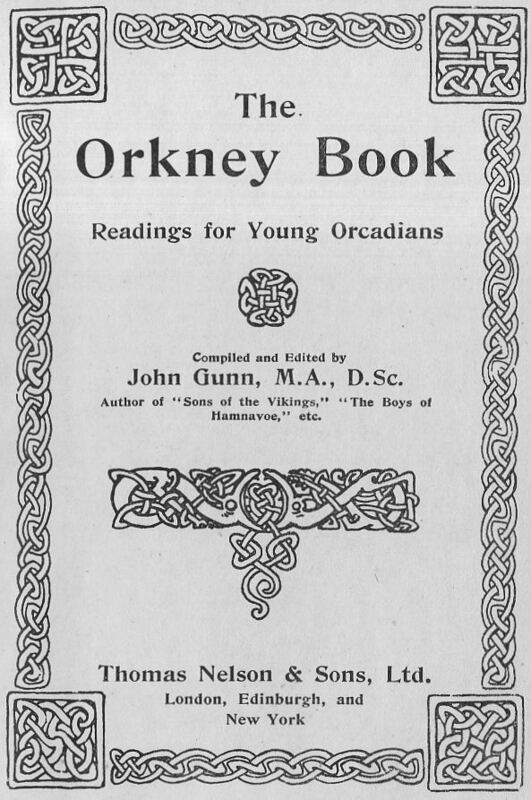 It owes its origin to the Edinburgh University Orcadian Association, the members of which realized the desirability of preparing for use in the schools of Orkney a book adapted to the special conditions of the Islands. Educationists now recognize that Knowledge ought, like Charity, to "begin at home :" this is true of every branch of knowledge—history, geography, literature, and the rest. They might even adopt with an educational reference the saying of the wise man, "Wisdom is before him that hath understanding; but the eyes of a fool are in the ends of the earth." An attempt has accordingly been made in this book to present to the young folks of Orkney a general view of their homeland, some description of its past and its present, and some knowledge of its naturalistic and its humanistic aspects, with the object of awakening their interest in their own Islands, in order that from this centre their knowledge may advance the more surely to the sweep of a wider horizon. For, like Charity again, while Knowledge must begin at home, it must not remain at home. While the scope of the book is wide, the treatment of each class of subjects is necessarily suggestive rather than exhaustive. All that is possible within the limits of a single small volume is to present illustrative specimens rather than a complete collection of studies. Hence there is abundant opportunity for the teacher to supplement the book by specializing in one direction or in another according to individual preference. The aim has been rather to supply the irreducible minimum, suitable to all, in the hope that the book may find its way into every school in the county, and be read by every Orkney boy and girl before their schooldays are over. The Committee of the Edinburgh University Orcadian Association who have superintended the issue of the book acknowledge gratefully the courtesy with which copyright material has been placed at their disposal. They wish to record their obligations to the Controller of His Majesty’s Stationery Office, to Messrs. J. M. Dent and Co., Messrs. Longmans, Green, and Co., Messrs. Macmillan and Co., Messrs. W. and R. Chambers, and the Walter Scott Publishing Company, for the use of the extracts to which their names are respectively appended, and to Messrs. Thomas Nelson and Sons for much copyright material, including numerous illustrations. 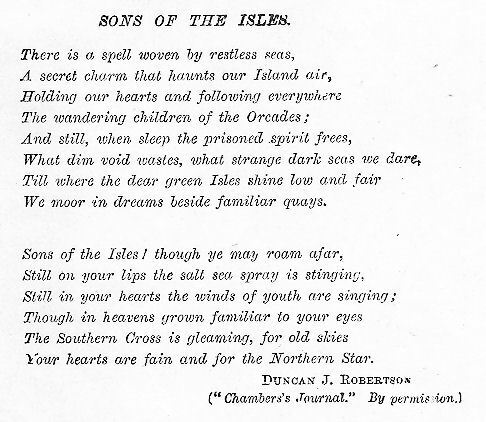 They also desire to express their thanks to the Honourable Mrs. John Dundas of Papdale, and to Messrs. Duncan J. Robertson, J. Storer Clouston, and Edmund Selous for literary contributions which are in themselves sufficient to give a high value to the collection, as well as to place on record their indebtedness to the late Mr. James Tomison for the article on "The Birds of Sule Skerry." 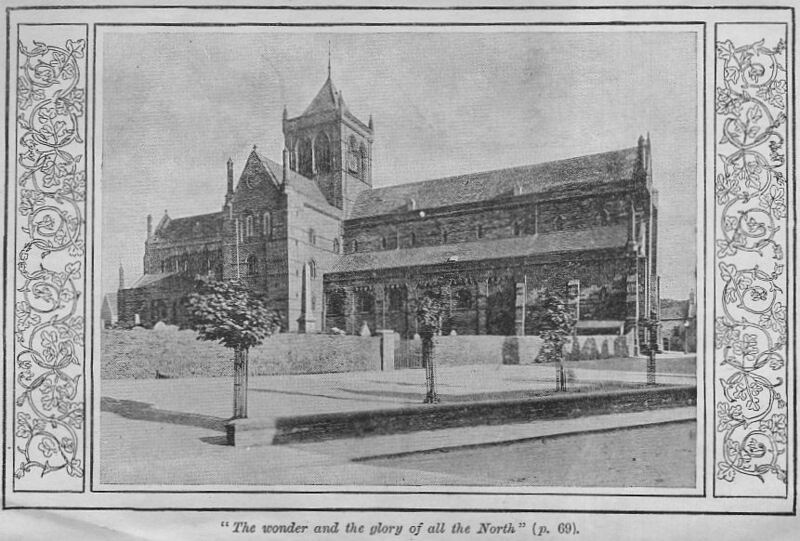 The matter contained in the unsigned articles has been contributed by many Orcadians, specialists in their several departments, whose names are sufficient guarantee for accuracy— Messrs. James W. Cursiter, F.S.A.Scot., for Archaeology, including illustrations; James Drever, M.A., for Norse history and language; John Tait, M.D., D.Sc., for Zoology; John S. Flett, M.A., D.Sc., for Geology; Magnus Spence, F.E.I.S., for Meteorology and Botany; John Garrioch, M.A., for Seaweeds; John W. Bews, M.A., B.Sc., and George W. Scarth, M.A., for botanical and descriptive material; Robert C. Wallace, M.A., B.Sc., for descriptive material; and John Gunn (Kirkwall) for the list of Orkney birds in the Appendix. As regards the artistic features of the book, special acknowledgment is due to Messrs. Thomas Kent, for his generosity in placing at the disposal of the Editor the whole of his unique collection of Orkney views, all the photographs reproduced being from his studio, with three or four exceptions; T. Marjoribanks Hay, R.S.W., for his drawing of St. Magnus Church, Egilsay; Stanley Cursiter, for the decorative initial letters, the title-page, and the cover design; and Miss Rose Leith, for the border designs of the grouped photographs; and to J. G. Bartholomew, LL.D., for the two-page map of the county. The Editor, who must accept responsibility for the general scope and plan of the book, as well as for the actual form and part of the contents of the unsigned articles, desires personally to acknowledge the valuable assistance he has received from the members of the Committee, especially Dr. John Tait and Mr. James Drever, and from the other friends who have helped by their sympathetic criticism and advice, to all of whom, as well as to himself, the work has been in every sense a labour of love; and he ventures to express the hope that the results of that work, as here visible, may find favour in the sight of all young Orcadians, and of many who are no longer young. - J. GUNN. EDINBURGH. 1909. Please note that all links here are to adobe .pdf files for which you will require the adobe reader. Part 1.—The Story of the Past. Part II.—The Isles and the Folk. Find out about life in Orkney - where we work, what we do, how we enjoy ourselves - everything that life in our small but impressive corner of the UK has to offer. The fresh clean pastures, clean air, pure water and cleansing sea currents mean that Orkney grown food is as good as it gets. In Orkney you will find some of the finest food products you can get anywhere in the world. Novelists, poets, and literary travellers are all fond of writing about the picturesque islands of the North Sea, the nearest of which is separated from the Scottish mainland by a rough sea-passage, always disturbed and stormy enough to deter the exploratory propensities of any excursionist liable to that most prosaic of maladies—sea-sickness. Nevertheless, despite the number of works which treat of the Orkneys, there remains still a good deal to be said about their scenery and the inhabitants. The author of this series of “Rambling Sketches” gives an exhaustive and interesting description of Orcadian history—ancient and modern—of the scenery by land and by sea, and of the people, as they were and as they are. During two summer trips to “the Far North,” he visited many localities familiar by name to readers of “ The Pirate ” and to students of the old Norse Sagas, made himself acquainted with every extant tradition, shot sea-birds, hunted seals, talked to fishermen about their work and to farmers about their crops, deciphered quaint epitaphs in old churchyards, and engaged in antiquarian researches. The most entertaining chapters are those relating to the romantic folk-lore of the islands, the even now half-accredited superstitions of old. The stories of the vagaries of the “trows,” or fairies, and of the enchanted “selchies,” or seals, are amusing and well told, being free from stiffness and pedantry of style. With discrimination, the writer has wisely constituted each “Sketch” complete in itself, so that, after first perusal, ready reference may be made to any particular passage, a very desirable result when the volume comes to be, as is likely, employed as a sort of guide-book.